Thanks Dawn, Nancy, Elizabeth, Lois, Annie and Lyn for responding to my last post! I like the idea of making my own lables so I am going to look into designing one clearly giving the message I want to portray but in the interim I have ordered some iron/sew on lables just printed with my name and blog address. They are already on their way from local business MyStuff (great service, posted on the day I ordered them! ), a company which I had never heard of before but Carmen discovered the other day. The only problem I had on the website was that while I wanted to order the large lables with 3 lines of print (name, blog address and tag line) and this should have been possible there was no form to do so. Obviously I could have rung the company but to be honest I am so short of time I just opted for the 2 lines of text and I can send them an email or ring another time if I haven’t got it together at that stage to make some myself. The weather improved yesterday and it is also dry at Clasheen today although for how long I ask myself considering the rain and wind we have been having for the last few days. I managed to take a couple of bad pictures of some framed pieces this morning so many apologies about the quality. The light is difficult to shoot accurate colours in and as I don’t have a light box or any professional equipment please bear with me. 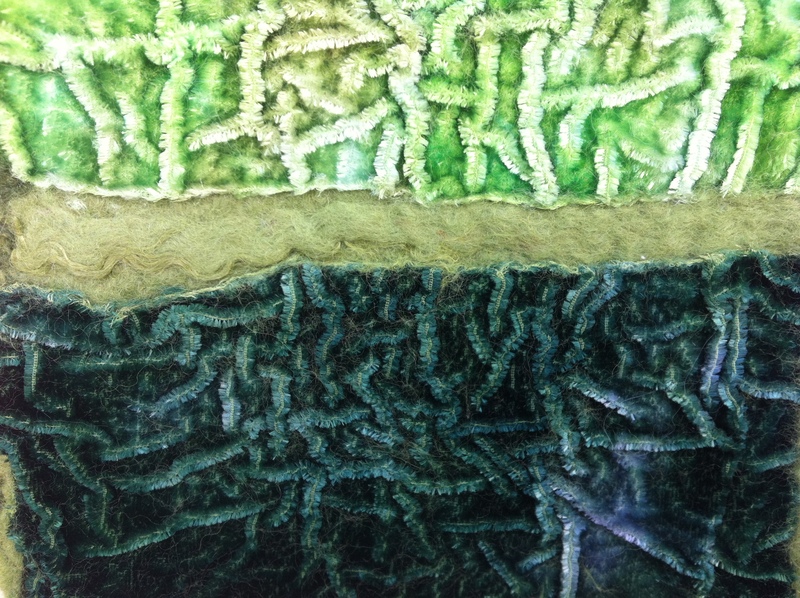 This piece is an abstract landscape, I absolutely adore the highly textured effect of the felted silk velvet! 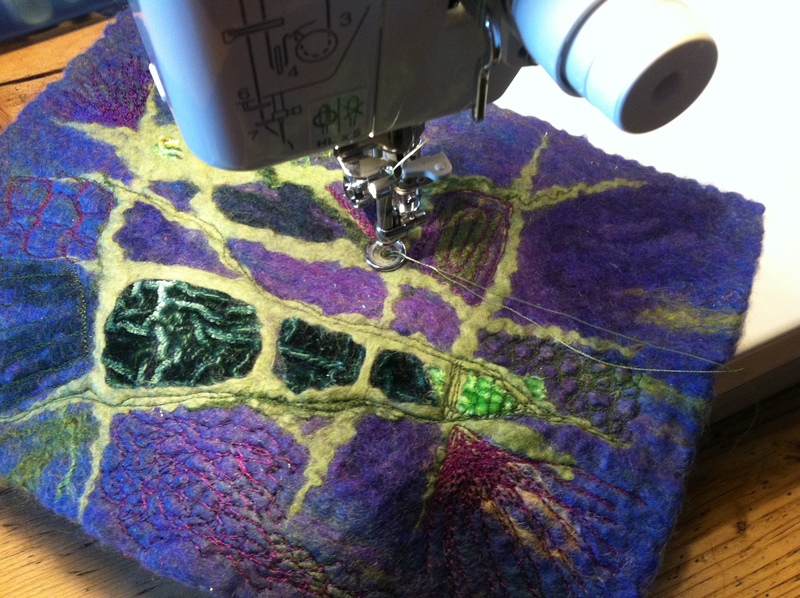 Interestingly Kim Winter posted about felting with silk velvet the other day on her great blog Flextiles and I read the post in the evening after I had spent the day finishing and framing my pieces. Great minds think alike??? I won’t say fools seldom differ! Anyway, like Kim I had previous experience or rather lack of successful experience when I experimented with felting velvet before. 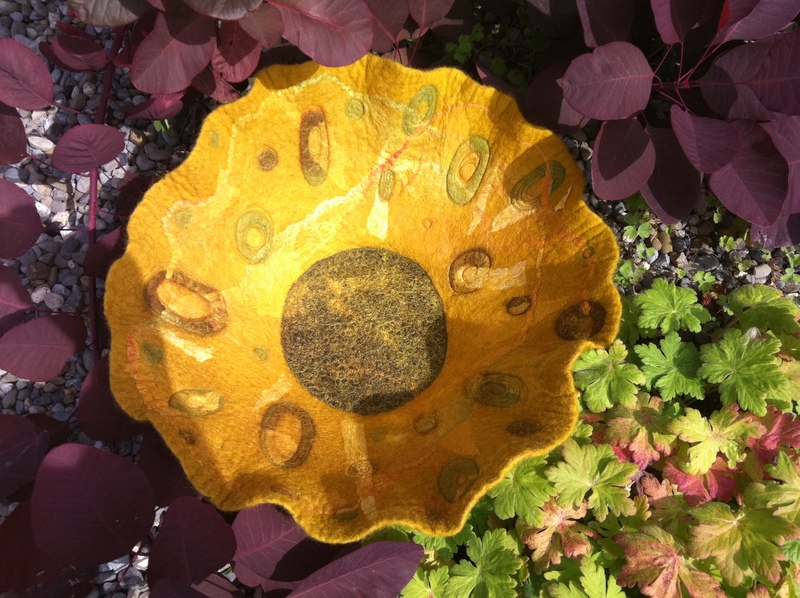 I know that it is possible to trap it by laying fibres over the top but wanting a clean surface I decided to try once more using silk velvet, I thought that this was what I used the last time but maybe it wasn’t, I had got the fabric as a present so didn’t know the exact fibre content. 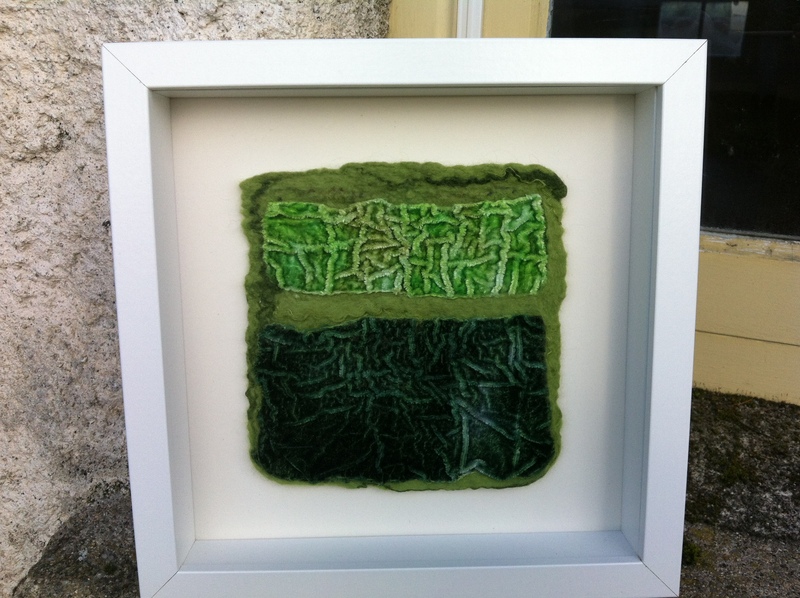 Initially I felted a few landscapes with only selected pieces of fabric but for this one used two larger pieces of velvet in a lighter and darker shade of hand dyed green. I love the simplicity of the design and now am looking forward to stocking up on more fabric, probably from Jean Oliver of Oliver Twists when she brings her luscious supplies to the Dublin Knit and Stitch Show in November. 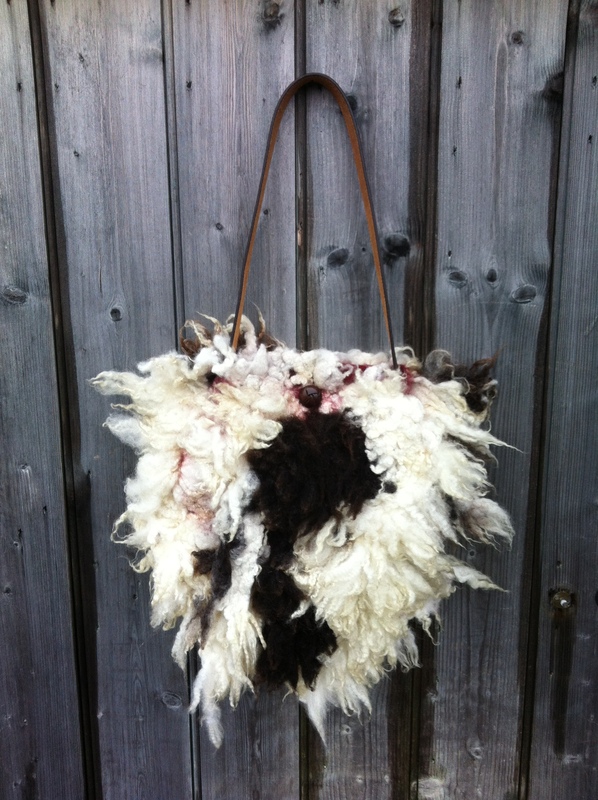 I also finished one more raw wool bag yesterday and felted another, busy huh? Below is a picture of the second bag (more in a little album on Facebook), this time with inside pocket, fabulous large vintage button closure and felt handle stitched in. The third bag that I felted this week used the same resist as the second. The finished size is a little smaller however because when I removed the resist I cut into the felt in such a way as to include an integrated handle, pictures of this bag when it is dry and has a closure fitted. Today I have been procrastinating but unfortunately I can’t for much longer, I’m supposed to be doing my accounts for the year up to December 2010 but I HATE paperwork! I also need to go and vote in our Presidential election, we have 2 referenda to vote on too so I better get my finger out and log off this computer pdq!!! Stitching, finishing and framing felt plus a question I am hoping to find an answer to! 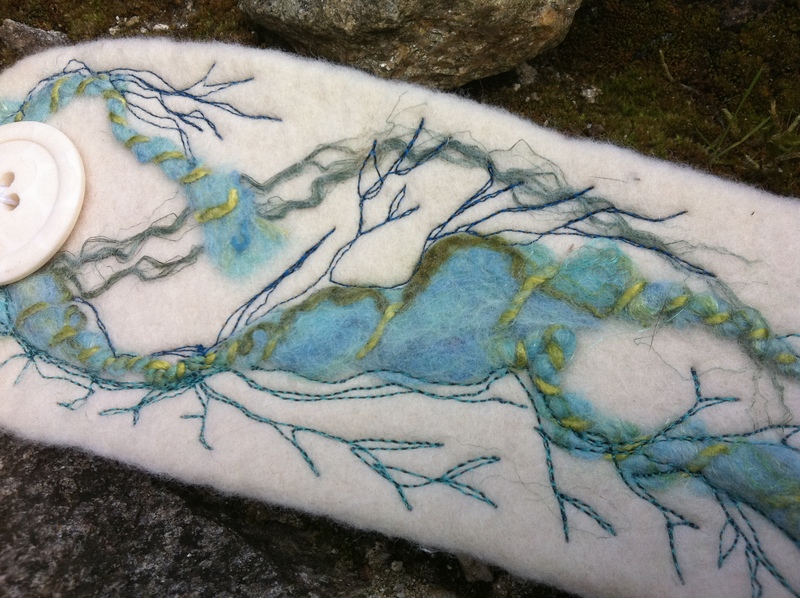 I started this morning by free machine embroidering a couple of abstract felt landscapes. It’s difficult for me to decide when enough is enough with this sort of work, my personal preference has always been for NO stitching or embellishing but I do realise that not everyone feels the same way! After Lisa Klakulak’s wonderful workshop at Felt in Focus I have really been trying to stretch myself in this direction, luckily Carmen arrived half way through the morning and was just in time to stop me stitching on some glass beads too, even she said that they were one step too far!!! Once the stitching was finished I needed to iron one piece to flatten it a little and then frame them before packing them all away for taking to Carlow tomorrow afternoon. I like my textiles displayed within a simple white frame without any glass covering the felt and feel that being so tactile they are definitely best displayed in a manner to invite the viewer forwards and tempt them to touch! Sticking some pieces of velcro to the mount I offer the felt up to the hook side (of the velcro), press it in place and voila, the work is framed. If this is not making total sense there are some pictures of the process I use in the section about displaying felt in ‘From Felt to Friendship’. Why are these pieces heading in to Carlow tomorrow afternoon? The Blueprint group that I am a member of is having a Christmas exhibition with a theme of urban and rural landscapes, the work is juried and curated and I would love to have one of these new pieces accepted. I almost forgot, I actually ordered a batch of name tags this afternoon to stitch into bags and on the back of framed pieces, I don’t think that they will be ‘pretty’ enough to stitch inside vessels or on to scarves so this begs the question do any of you know where it is possible to order personalised tags online that look gorgeous and don’t cost an arm and a leg??? Thanks! 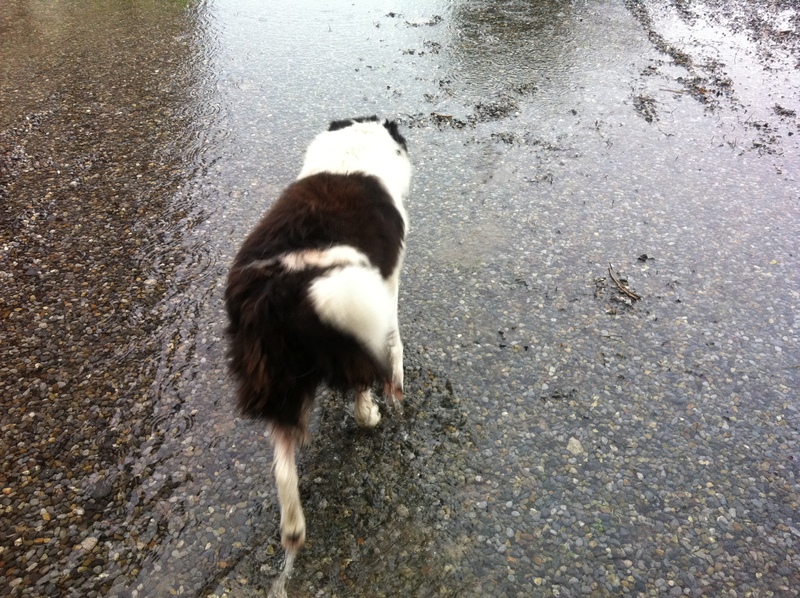 Rex trots through the flood outside my door this morning! I’ll leave you with a picture of Rex plodding through the water outside my house this morning! Following on from this it rained ALL morning but thankfully has now cleared up and is actually warm and humid, amazing. Special offer for October and an iPad, iPhone and iPod touch version of our book is now available to download!!! Because of all my computer problems yesterday and the fact that I am really trying to knuckle down and get some felting done this week I didn’t fully appreciate what Chrissie was up to until I got an email saying that ‘From Felt to Friendship‘ is now available to order as an ebook! What this means for anyone with an iPad, iPhone or iPod touch is instant gratification, no postage, a cheaper option than the hard copy book and all available at the press of your finger!!! Click here to order directly through Blurb, the ebook costs $23.99, thanks Chrissie for setting this up. I did manage to upload two bracelets to my Big Cartel shop this morning and to celebrate this relatively stress free occurance (as opposed to yesterday’s nightmare!) have decided to offer 15% discount on all sales through to the last date in October. To avail of this special offer please enter the code OCTATCLASHEEN when you reach the checkout. More products will be finding their way into the shop each day this month, at least that is my plan and I am sticking to it for the moment. Finally I did get a kind of business page set up for Clasheen on Facebook yesterday. It’s titled ‘Nicola Brown – Clasheen’ and I would really appreciate your support (obviously only if you like it!) by clicking the ‘like’ button, I’ve even added a button on the sidebar to the right just to make things easier for you! 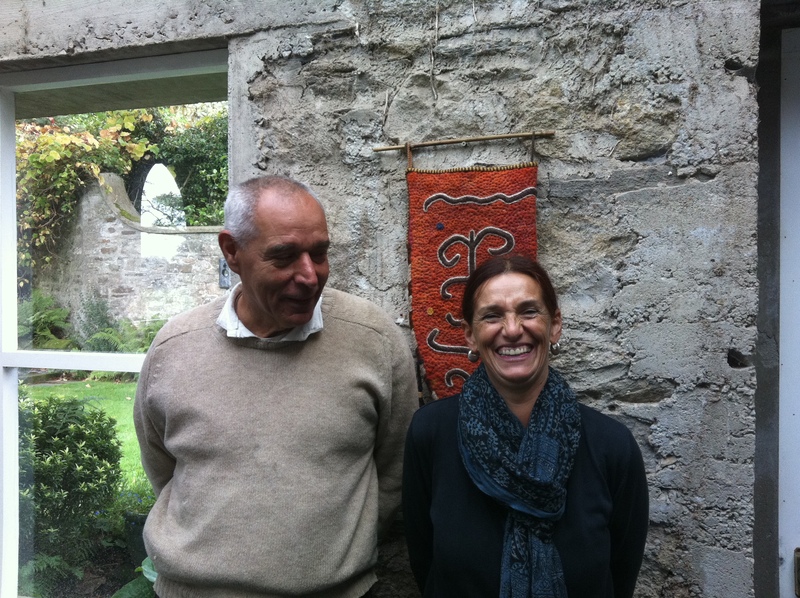 Istvan and Trees arrive in Ireland, a special 4 days of felt related activity is underway! It’s official, felt masters Istvan Vidak and Trees Coussement have arrived in Ireland! Carmen and I returned from collecting them at the airport last night at 11pm and then I spent until 2.40am cooking at Clasheen, whew, I will sleep well tonight. This morning I drove back to Carmen’s to collect Istvan and Trees and we went together to meet up with Jeremy Hill at the wonderful Norman Gallery where an exhibition of their work will open later tonight. I helped Vidak and Trees organise the felt and I have to confess to buying one of Istvan’s stunning decorative bags too! After meeting the workshop participants and grabbing a quick lunch it was back home for me to finish fitting the units in the back kitchen. Now I just need to tidy the bedrooms where 3 of my friends will be staying then it’s off to the train station for me and flying to Birmingham at 6.30am with Alan for the weekend! Tomorrow while Alan is at a meeting I am going to head to a textile market I discovered on a search for saris and the like to nuno felt with! 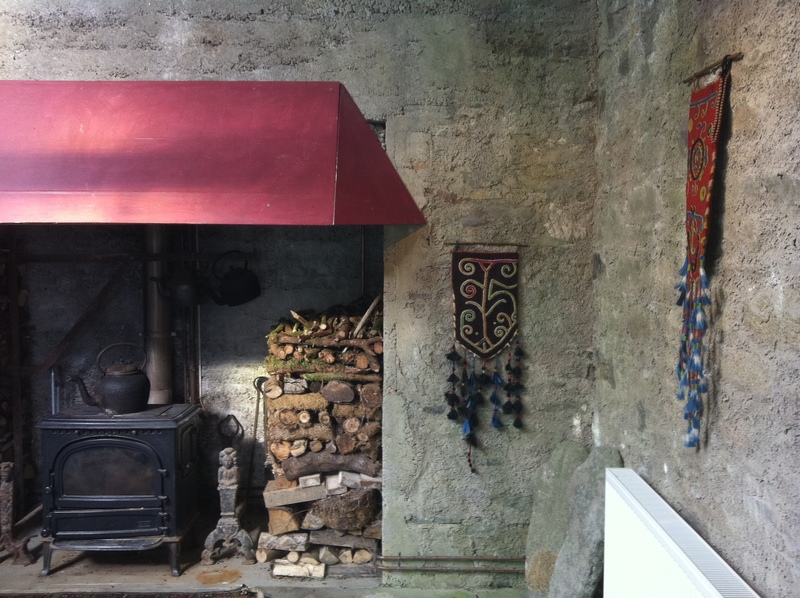 On Monday I will meet up with Carmen, Istvan and Trees again and get the chance to see some of the beautiful work felted over the next 4 days. While I am away Rex will be in seventh heaven with all the house guests and loads of walking. Possibly I won’t get to do much over the internet until Monday evening but I do promise to upload a few pics via Facebook if I get a chance to catch my breath and find some yummy fabric!